TOMBOW OBJECT 202: Combining translucent resin finishes with contemporary design and function. Plastic comfort grip. Featuring Tombow's famous smooth writing tungsten-carbide rollerball. 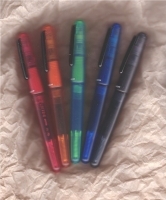 Refillable using any Tombow Fine and X-Fine Rollerball refill cartridges. List Price $10.